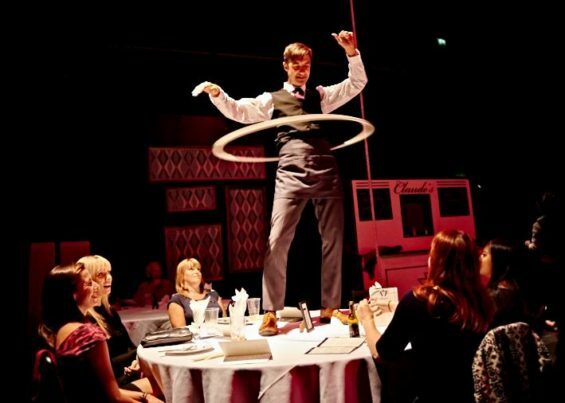 Claude himself is played by George Fuller, who welcomes us at the door as maitre d’. Our names are ticked off on the seating plan, and we are shown to our tables. 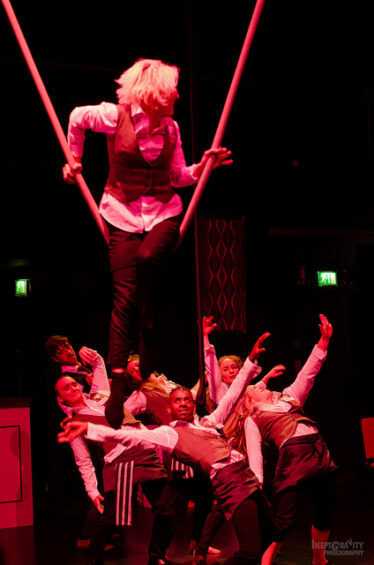 The Weston Studio in Wales Millennium Centre has been transformed, with 12 circular tables laid for dinner, each seating 9 or 10 and each with an extra ‘reserved’ seat which performers rotate in and out of as the show progresses. I’m delighted with the large round badge I’m given that, by dint of its acrobatic image and colour scheme, denotes my menu requirements for the evening. I’m charmed by attention to small details, and this show is full of these thoughtful touches. 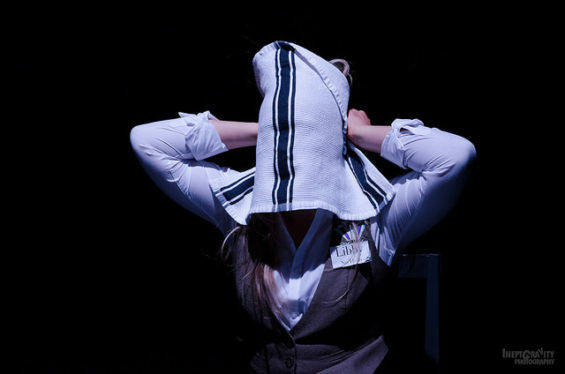 The script has been co-devised with award winning Associate Writer Alan Harris, and delivers comedy and a developing pathos in moments of interior monologue that, piece by piece, reveal the inner workings of our professional waiting staff. Between the pre-recorded trains of thought is space for varying degrees of improvised interaction and fantasy choreography that allow us to enjoy our meal at an appropriate restaurant pace. As the evening shift comes to an end, the waiters contemplate life outside of Claude’s, and the dinner party finishes in elation and a party of paper napkins, coloured straws and confetti. The joyful energy continues well after the performers have left the arena, and guests are tossing paper aeroplanes across the room and building a giant snake of drinking straws as I pay my drinks bill and head home. In my head echoes one of my table mates’ parting comment, “I’ll be so disappointed next time I go for a meal and it doesn’t have all this”.